BACKTIME: The Trick for Vick: Gotta be like "Mike"
The Trick for Vick: Gotta be like "Mike"
"There's a lion in my pocket, and baby he is ready to roar." 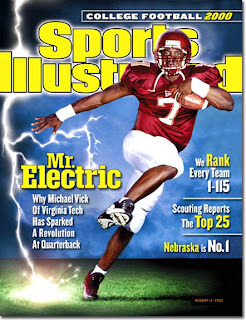 It was 10 years ago when I did a shoot with Michael Vick on the Virginia Tech campus. He was a phenom as a redshirt frosh, but he just seemed polite, friendly, and very unassuming. When he introduced himself as "Mike," I didn't know who he was right away. There wasn't an entourage, there wasn't bravado, it was just Mike. But there was plenty of bravado in my script and he didn't carry it like that. He was shy. The piece was average and didn't air because Vick got beat up by the Clemson "D" - though the other man on the shoot, Corey Moore, was the dominant defensive star in a Hokie home win. I'm not trying to extol the virtues of Mike Vick, the seemingly mature 19-year old. This sick subculture was obviously ingrained in him from a very early age. And somewhere deep inside him was a Ron Mexico with middle fingers extended to his home crowd. But we had truly never seen anyone like him. A black, left-handed whirlwind who probably could have been the best player on the field at a half-dozen positions. He did it with such confidence and class. His play screamed "look at me" so he never had to do anything arrogant to call attention to himself. In Mike's freshman year, he led Virginia Tech to an undefeated regular season in spectacular fashion. And he left his guts on the Superdome field erasing a 3-TD deficit to Florida State before falling in the 4th quarter. Head Coach Frank Beamer is still his biggest advocate. Two years later, Mike was drafted #1 overall. Three years after that and one broken leg later, he finished 2nd in the MVP voting, and led the Falcons to the NFC Championship game. Then came the contract. The sense of entitlement. The rules didn't apply to him. He could spread herpes around, or bankroll dogfighting, or smoke pot on his MySpace page. He thought the authorities and the media, much like your average NFL defender, couldn't catch Michael Vick. "Tryin' to run from my destruction, you know I didn't even care." He was wrong and paid the heavy price. This isn't some run-of-the-mill NFL suspension he has to come back from. He was incarcerated. Every day is a blessing for this man. This time around, I think we're going to see a lot less Michael and a lot more Mike. And maybe one team's fans will party like it's 1999. I wonder if Mike is wanting to come back in as a QB or just a player? I think he would be particularly devastating as a punt/kickoff return specialist. Very well done. Makes you remember we all come from something...we must decide where we go with it. And I have to say...even deserve a second chance.